I picked up Doomy2 quite awhile back, then Hunters Grim recently. 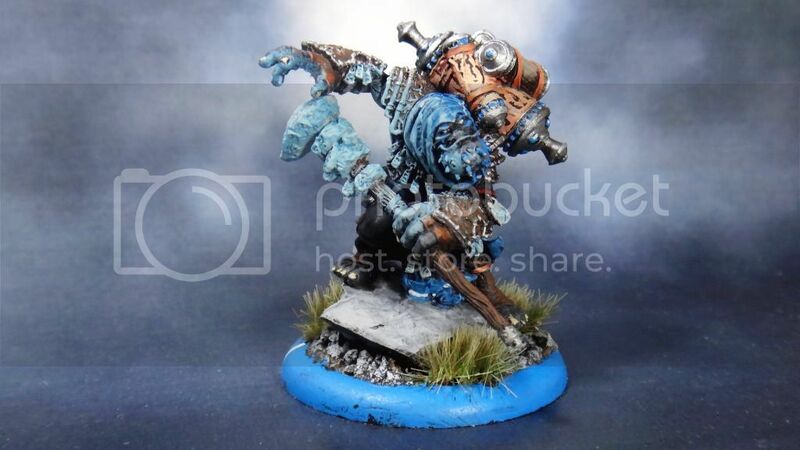 Doomshaper2's model isn't quite as awesome as Doomshaper1, but it was fairly straightforward to paint. Hunters Grim, however, are awesome models, and I buckled down to paint them over the last few days. First off though, Doomshaper2. I really liked Grim2's model over his previous model. Grim1 wasn't bad, but Grim2 is fantastic. Reminds me of the Tom Selleck movie "Quigley Down Under", so therefore I ran with that for a paint scheme. I didn't know what to do with Muggs and Krump, but decided to stick to the red shoulder pads and blue shirt. 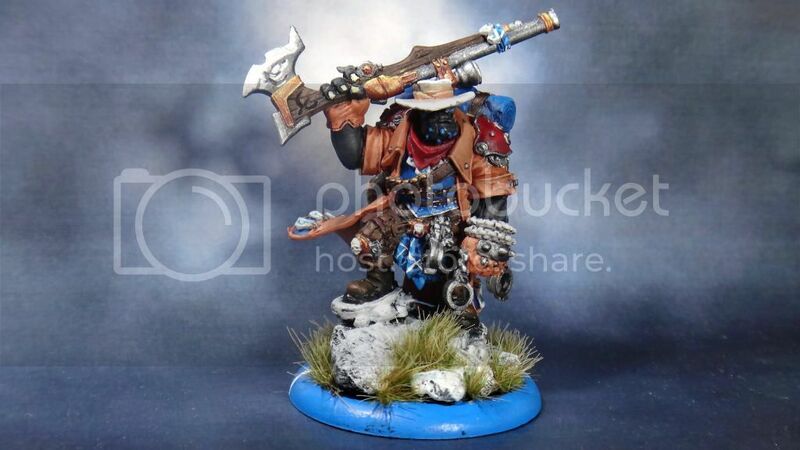 The brown coat on Krump turned out particularly awesome, and his gun as well. 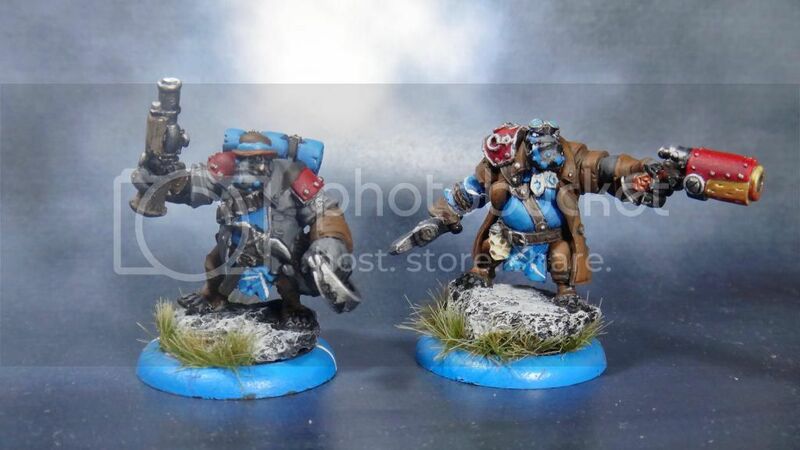 I pretty nearly like the paintjob on Krump more than I do Grim, but it's pretty close. The camera took a dump on Muggs though, unfortunately. I liked the grey coat, but not as much as Krump's. With the purchase of Grim2, I'm going to try and push both of these casters as my 2 list format. Madrak2 is probably my favorite caster, but I don't feel he answers enough questions strong enough. He can handle armor skews and infantry skews, but he struggles against a lot of shooting, and doesn't answer Cryx. This leaves an anti-cryx list, but that's Grim1 or Grim2, and neither can handle shooting lists. So I'm bringing Doomy2 as an armor/beast skew, and Grim2 as the anti-infantry/anti-cryx. We'll see how it goes, but I'm more confident about it. On top of that, playing Grim2 is incredibly fun. Madrak's pretty straightforward, and doesn't require a whole lot of shenanigans. Grim2 brings only shenanigans, and nothing more, and it's a lot of fun. Retribution? What, just shenanigans? He's really weird. I like him a lot, but it's janky. The nice thing is that there isn't anything he can't do. He can't do a lot of things exceptionally well like Madrak1 makes things hit extremely accurately, while Madrak2 makes them hit extremely hard. Grim2 can do both, but not extremely well. Have you looked at his card? He's got pretty decent survivability for a caster that wants to be frontline. He's hella good at eliminating solos, even stealthed ones. He's got a RNG10 spell that drops enemy unit/model's DEF/ARM by 2, and removes tough. His feat gives everyone Snipe, and essentially +2 to hit on ranged attacks. 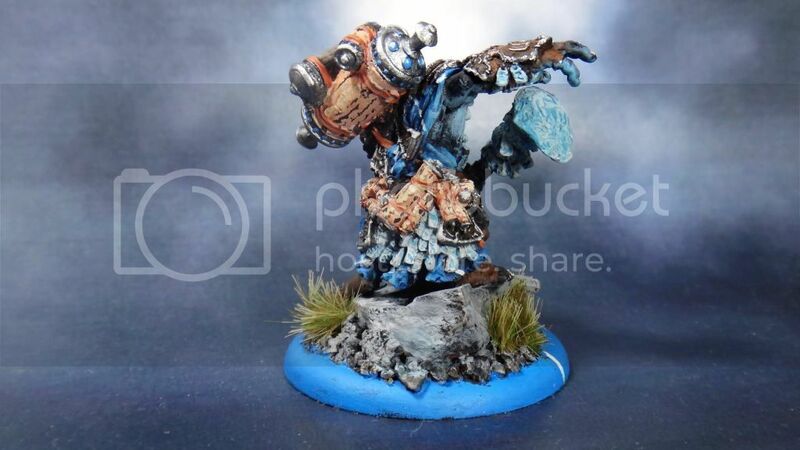 His other really neat spell lets you place a model within 2'' during your control phase, so you can put it on a unit. So you can unengage ALL of your Fenns, and then Vengeance? Or you can move up your Scattergunners or unengage them so they can aim, and on feat turn, they're RAT9. With Mortality on the target, they're RAT11. On top of that, the scattergunners don't hurt Friendly models with their 8'' spray. So they scoot 2'' in control phase, aim, shoot through the Fenns and annihilate everything (RAT7 POW12 sprays with aiming. RAT9 POW14 with Mortality), and now the Fenns get to charge again. It's pretty solid. 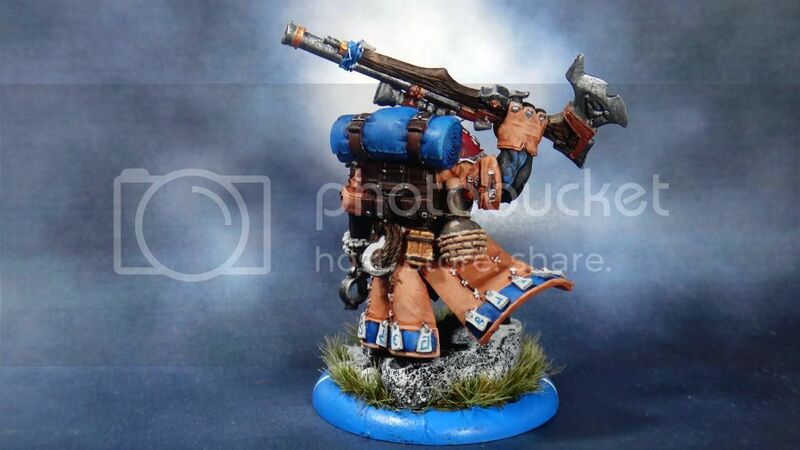 I also love the coats in this unit. 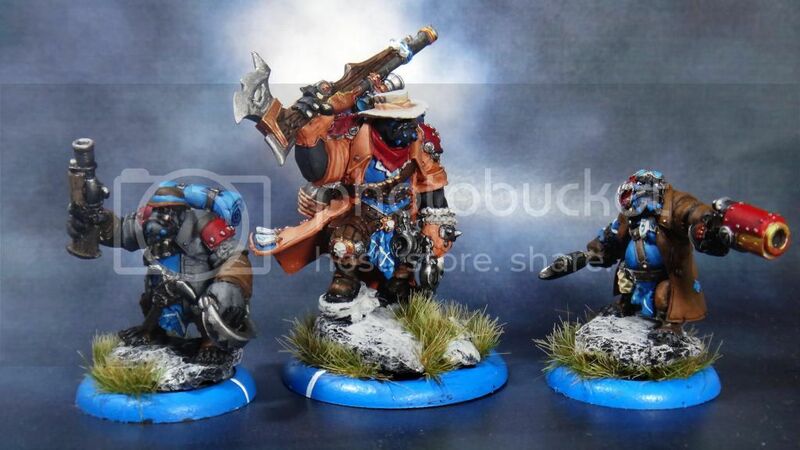 I like some of the Skorne stuff, but guys like Mordikaar... Eh. I like the armor though on a lot of them. If I've just finished watching The Last Samurai, I want to paint Skorne. 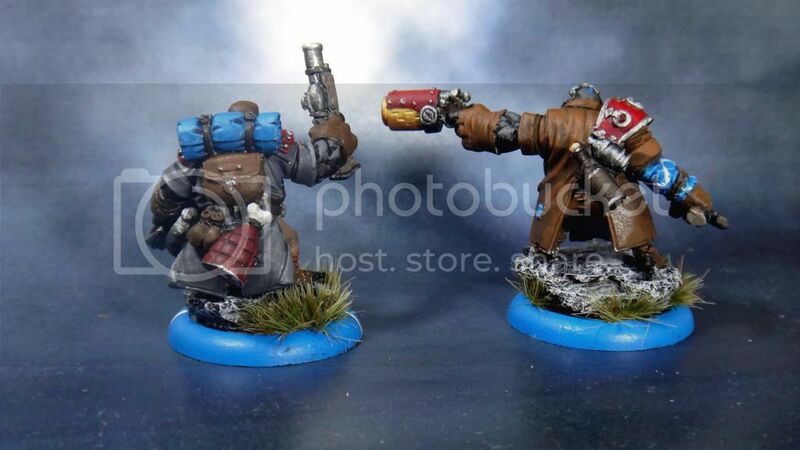 But yeah, the coats on these guys are awesome. I'm particularly proud of how well the browncoat turned out. I would have done brown on Grim2 himself as well (A Captain Reynolds scheme was option #2), but with the Quigley scheme, it didn't work. These pics don't do them justice either, you should see them in person. On a side note, what do you think of Doomy2? Is the glow from the staff defined enough? Mordikaars armor is alright but the hanger arm on his back kinda ruins it. Plus his face...But yea, i love the samurai look, especially on the cyclops' . Yea the glow shows up pretty well. At first i thought a three year old had applied his war paint but then i saw the staff. I saw someone do something similar with Xerxes. It looks good. Did you use the air brush? Very nice painting, as with all your stuff. I'm interested in the colour choice for Doomshaper2's hood. In the pictures, it looks very close to his skin tone. Is this deliberate, or just a trick of the camera? On the left side, they're the same shade because of the glow from his staff. Outside of the glow, the hood is the same blue tartan, and his skin tone is the same black as everything else. Glad you like it though!